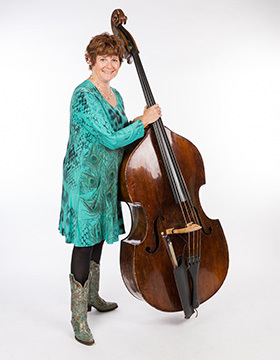 Two weeks ago on Bluegrass Today Dave Berry of the California Bluegrass Association conducted a substantial interview with Lisa Burns (left), multi-award-winning bassist and a pillar of the California scene. While the interview includes tips specifically for bass players, the middle third of it - on timing, using the metronome, practice methods, and getting the whole band to gell - is worth reading for anyone who plays in a group. Update 2 Nov.: Today, Bluegrass Today publishes Dave Berry's interview with master luthier Steve Gilchrist. Mostly about mandolins, of course, but of interest to anyone who's into instruments and the making of them - plus you can see a video (also on YouTube) of Chris Thile playing a Gilchrist Model 5.